Shopping at Walmart, as I often do, I can easily find all ingredients for this recipe as well as Quaker® Cereals, and products, we like to keep stocked like; Quaker® Real Medleys®, Quaker® Oatmeal Squares, Quaker® Simply Granola and Quaker® Life. 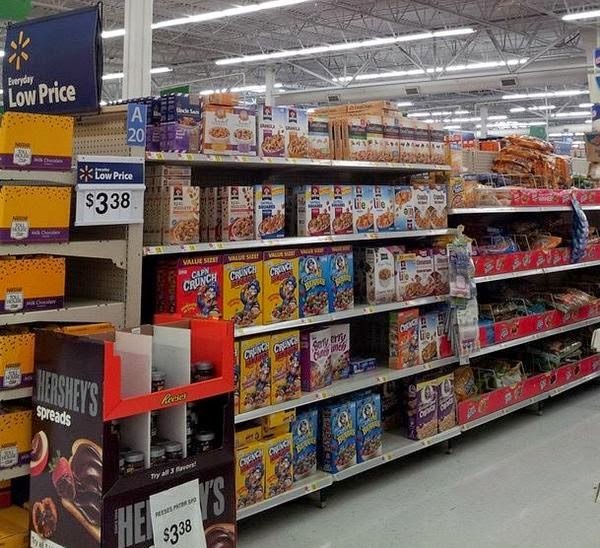 Located at the end of the cereal isle for convenient shopping. Not only are these cereals eaten for breakfast, my boys often request them to be included in their lunches as well as after school snacks. Isn't this topping gorgeous? Use any combination of cereals you wish, to make this your own! Let's get started making this Streusel Topped Sweet Potato and Carrot Casserole, shall we? These sweet and spicy ingredients, with slight hint of heat, make this Quaker® Cereal Streusel an over-the-top... topping! Just heat until melted and blends together. Not only is this an amazing streusel, it is great to eat as a snack. Trust me, I know. The first batch was eaten before it topped the casserole. Little hands, and larger ones alike, could be found reaching in the bowl at any given time. Double the recipe and keep in an airtight container for a day or so, I don't think it will last any longer than that if your family is like mine. Sweet potatoes and carrots are gently tossed with the syrupy mixture to coat. I could eat this right now, however, I refrain myself and put it in the oven to heat thoroughly, 25 to 30 minutes. Top with the sweet and spicy streusel made with Quaker® Real Medleys® and Quaker® Life Cereals. Any cereal combination will be wonderful. I used Quaker® Real Medleys® Cherry Almond Pecan Multigrain Cereal and Quaker® Oatmeal Squares Brown Sugar. 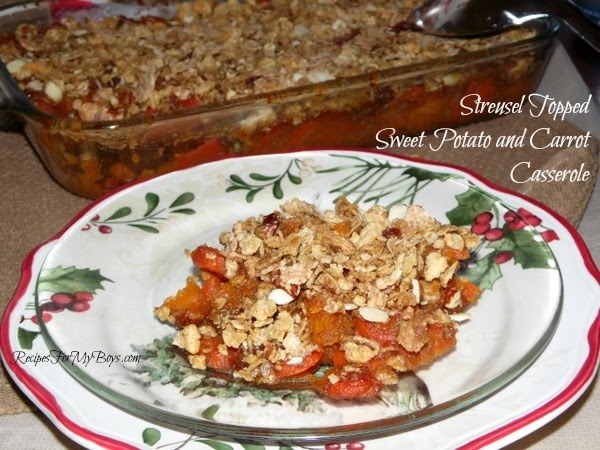 I also make this streusel using Quaker® Real Medleys® Peach Apple Walnut and top baked sweet potatoes...yum! Perfect to accompany any holiday meal or your everyday, I need a side now...mom, what's for supper, dish. Drain sweet potatoes and carrots. Spray 13x9 pan with non-stick spray. Add sweet potatoes and carrots. Heat butter or margarine, maple syrup, brown sugar, cinnamon and cumin until butter is melted and brown sugar is dissolved. Pour over sweet potatoes and carrots, lightly stir to coat. Bake in preheated oven 25-30 minutes or until warmed through. While baking, make streusel topping by crushing Quaker® Life and breaking larger pieces of Quaker® Real Medleys®, put in a small mixing bowl. Heat butter or margarine, syrup, brown sugar, cinnamon and cumin until butter is melted and brown sugar is dissolved. Pour over Quaker® Cereal mix and stir to coat. Remove casserole from oven. Top with as much streusel as you wish, save the rest in an airtight container for other uses (like snacking!). Return to oven for 5-10 minutes or until light brown, watch carefully so it doesn't get too dark. Enjoy!! * 4 medium to large sweet potatoes can be used instead. Boil 25 minutes, until just tender. Peel, slice or dice and continue with recipe. **2 - 3 cups fresh carrots, peeled and sliced, can be used in place of canned. Other than breakfast, what is your favorite way to eat, cook with and share, Quaker® Cereal?